Oh my God! This is sweet! What a great idea for a commission! Fantastic! Gotta start teaching these sentinels what a mutant is. 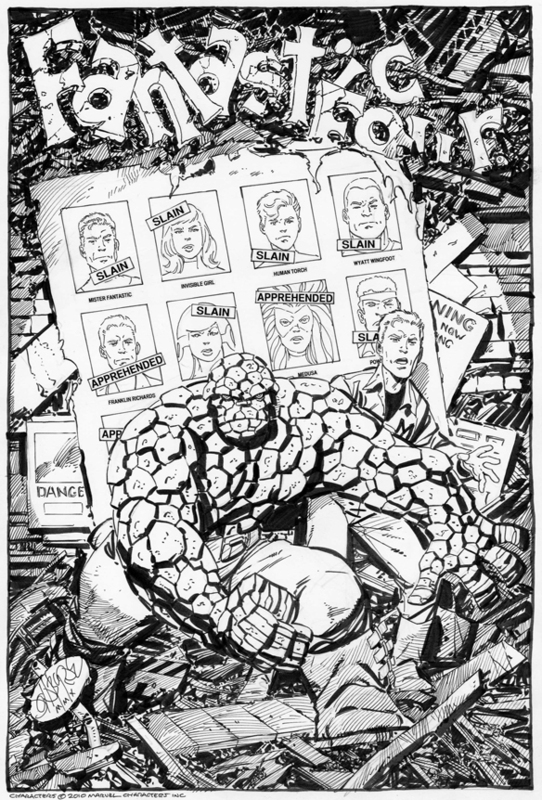 Too bad you weren't doing FF and X-Men at the same time when the "Day of Future Past" storyline was published -- I could easily see this being the cover for a Fantastic Four crossover special -- the story could have recounted the Fantastic Four's role in that future tale. Perhaps Ben and Franklin helped Kitty and Wolverine at some point off-panel . . .
Well, my "resolution" was to limit myself to one JB commission, and I've now done the easier part of it.... I'm getting chills just looking at it!! Thanks John (and Jim) for making this happen. Y'know, it's often been said that no one ever wrote a great story by sitting down and trying to write a great story. Great stories are often a surprise, to the writer as much as the reader. This is great! I really love what you did with the lettering at the top of the piece. Now where the heck does this fit in the gallery?!?!? FF covers? X-Men covers? FF covers. Not an X-Man in sight! Very nice piece, JB. I don't recall ever seeing a drawing of the Thing with his hand open. What a clever idea for a commission! I'd like to see an Avengers one. The lettering at the top really steals the show but Ben looks amazing. What a great idea for a commission. Cool start to the new year. Didn't 'Days Of Future Past' take place in the year 2013? That being the case, this scene could have played out on 01 01 10! I don't recall ever seeing a drawing of the Thing with his hand open. Not sure what this means! I don't always draw Ben with both hands as fists! One thing that has drawn my attention is how much more gaunt Franklin looks in this commission than he did (if memory serves) in the DOFP story. Makes sense given the living conditions one would assume were present in a mutant containment camp. Nice touch! I mean usually the Thing is holding something or making a fist. Great idea for a commission! Nicely done JB. Wilson Mui: I mean usually the Thing is holding something or making a fist. Wilson, that was one of the strangest comments I have ever read on this site! coverbrowser.com -- will show you hundreds of examples of an "open hand Thing" -- including the cover of Fantastic Four #1! Ben Grimm's a survivor that's for sure, but it's still hard for me to imagine Reed Richards being slain first. The "apprehended" Franklin also makes me wonder. Great piece, I'll be thinking about it all day now. is Ben the most loved character in the superhero comics era ? WOW, great way to start off the year! Congrats to the whomever ordered this. Makes me wonder who/what Ben & Franklin are staring at. JB, when you did this comission, and when you did the original X-Men cover, was there any rhyme or reason to who was "slain" and who was "apprehended"?